We help librarians connect communities. 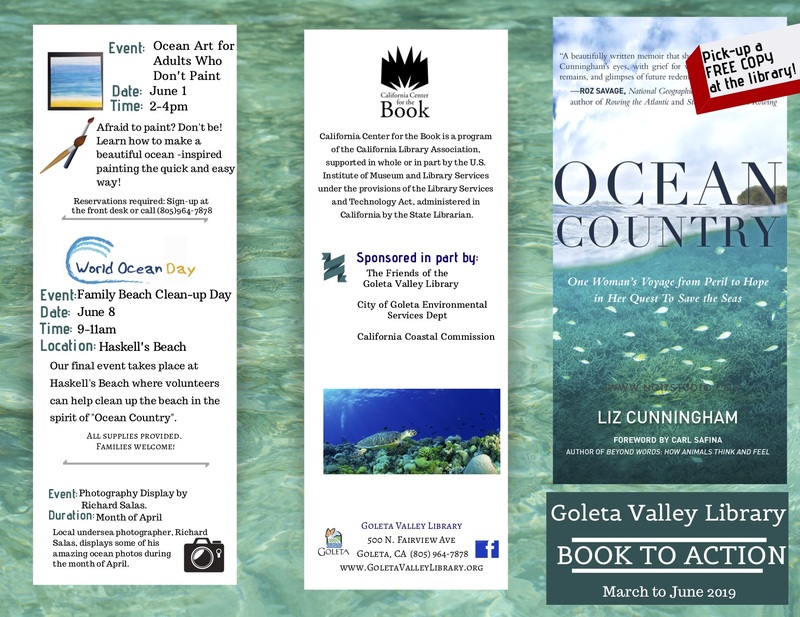 Goleta Valley Library’s Book to Action series features Ocean Country: One Woman’s Voyage from Peril to Hope in Her Quest to Save the Seas by Liz Cunningham. To learn more, see find the book description, press release, brochure screen grabs, and a link to a local news article below. The Book to Action series at Goleta Valley Library is in partnership with City of Goleta Environmental Services and the Friends of the Goleta Valley Library. 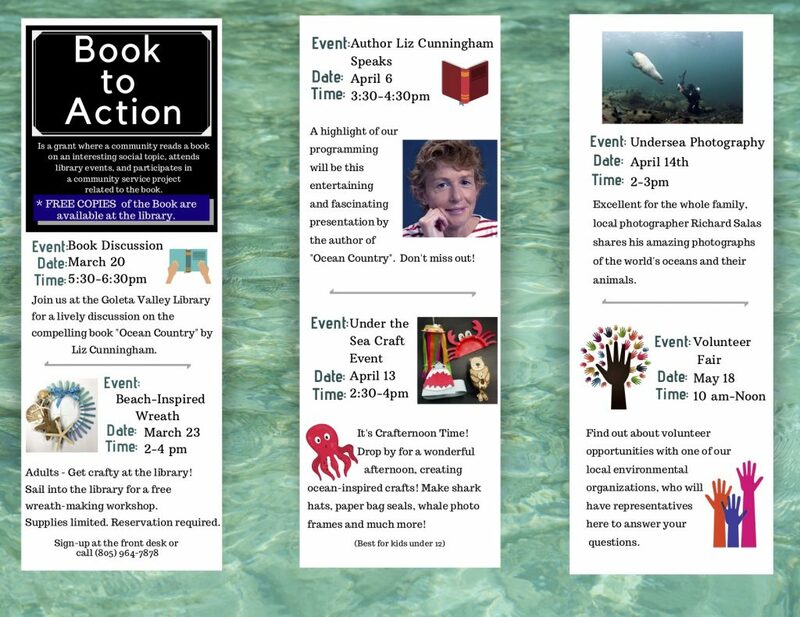 Goleta Valley Library Book to Action Selection Designed to Make Waves – Noozhawk article published February 19, 2019. GOLETA, Ca. – Goleta Valley Library is proud to announce our community Book to Action program, running March – June 2019, with support from California Center for the Book, and in partnership with City of Goleta Environmental Services and the Friends of the Goleta Valley Library. 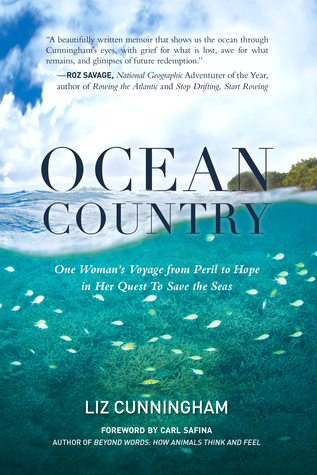 Wanting to take inspiration for social action from a powerful book, we have chosen the title OCEAN COUNTRY by Liz Cunningham. After a near-drowning experience, Ms. Cunningham decided to travel the world to view different areas’ efforts to rehabilitate our endangered oceans. This led to her writing the book OCEAN COUNTRY, which is poetic, stirring, and above all, hopeful. This book will allow all of us to think carefully about social action, what we can do to affect beneficial change, and give everyone the opportunity to participate in a civic engagement activity. Free copies of the book will be available at the Goleta Valley Library while supplies last. A wonderful array of activities is planned in conjunction with the Book to Action grant project. SPEAKER EVENT! Saturday, April 6, 3:30-4:30pm: OCEAN COUNTRY author Liz Cunningham visits the Goleta Valley Library and gives an entertaining presentation about her book. Saturday, April 13, 2:30-4pm: Under the Sea Craft Event: Drop-in craft event for kids under the age of 12. Make shark hats, paper bag seals, whale photo frames and more! Sunday, April 14, 2-3pm: Undersea Photography Presentation: Local photographer Richard Salas shares his amazing pictures of the world’s oceans and their animals – excellent for the whole family! APRIL: Photographs by Richard Salas will be on display in the Library all month. Saturday, May 18, 10 am – Noon: Volunteer Fair: Find out about volunteer opportunities with one of our local environmental organizations, who will have representatives present to answer your questions. Saturday. June 1, 2-4pm: Ocean Art for Adults Who Don’t Paint: Afraid to paint? Don’t Be! Learn to make a beautiful ocean-inspired painting the quick and easy way. Saturday, June 8, 9-11am: Family Beach Clean-Up Day at Haskell’s Beach: Celebrate World Ocean Day and volunteer to help clean up the beach in the spirit of OCEAN COUNTRY. All supplies provided. The Goleta Valley Library is one of 25 California libraries chosen for Book to Action 2019, funded by the California Center for the Book. California Center for the Book is a program of the California Library Association, supported in whole or in part by the U.S. Institute of Museum and Library Services under the provisions of the Library Services and Technology Act, administered in California by the State Librarian. February 26, 2019 in #BookToAction.